+ into an abundant debt-free life! Now, I spend my time helping women from all over the world get their budgets setup, get intentional with their lives, + gain a positive mindset along the way! Living on a budget doesn’t have to be stressful or complicated! ...and that's where I come in! I've got your back girl! Let's do this together! Your Sunny Money Method, is a simple approach to your family's budget! 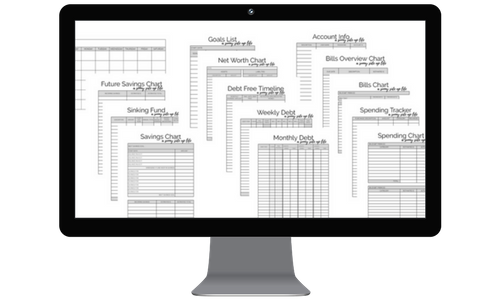 This pack of 14 Budgeting Worksheets can be customized to fit your family's needs! These Worksheets can be used digitally through Google Sheets or printed and hand-written. This is every worksheet that your family needs to get your budget organized! 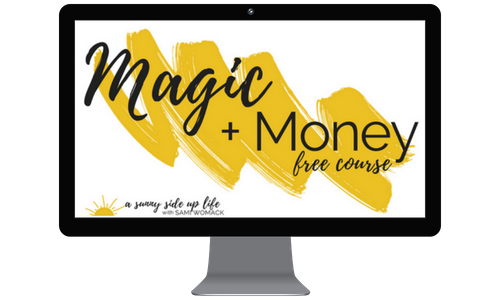 This free course was designed to help you revitalize your money mindset and rekindle your spark for life. Magic + Money will be sent to you via email with text and video material over the course of 5 weeks. With short actionable lessons this course is perfect for the woman that is ready to overcome the overwhelm of her relationship with money. Ready to get intentional with your spending? There's a better way friend! An abundant life is waiting for you! ...and I'll address some of your biggest questions + concerns about budgeting! ...and we'll do all of this in only 5 short lessons! The path of overspending has only caused stress + hardship...it's time to stop wasting 100s, and maybe even 1,000s, of dollars each month...it's time to start spending your money with purpose! Tracking your debt payoff + being able to visualize the progress can do wonders for your motivation! Adding up my family's debt was a major catalyst moment in our journey to financial freedom! ...and it will be your's too! Looking to sell some of your clutter around the house to make some extra cash? ...need help figuring out what to sell + where to sell it? Download my FREE cheat sheet to learn all of my best tips! Check out all of my favorite resources + must have items!